Photo Details: Elephant bull (Loxodonta africana) standing in clearing, Lower Zambezi National Park, Zambia. 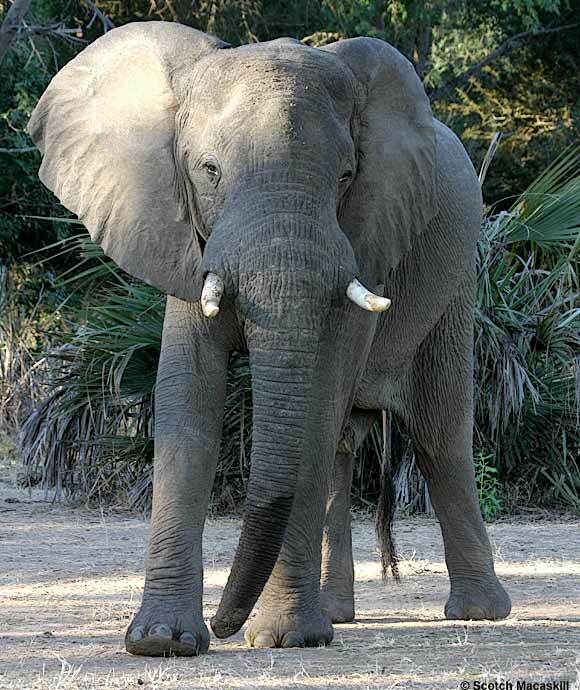 A Great Gift for Father's Day... A father African elephant is over 10 feet tall at the shoulder, and weighs about five and a half tons. This impressive king of the savannah also has a trunk that is strong enough to rip out trees by their roots, and yet is gentle enough to lovingly caress an elephant calf. Strong and powerful, yet tender and caring. Does this remind you of your dad? Take the time to adopt an elephant for your dad this Father's Day from WWF's Online Adoption Center and let him know how much you appreciate all he has done for you. WWF has been working to save the elephants of both Africa and Asia for over 40 years by reducing poaching, enforcing illegal trade laws that prohibit the sale of elephant ivory and by finding innovative ways to help reduce human-elephant conflict. The North American Nature Photography Association (NANPA) has announced that Thursday, June 15, 2006 has been officially designated Nature Photography Day. NANPA's History Committee was instrumental in establishing this date to focus attention on nature photography. Visit a park -- at lunchtime if you can -- and bring your camera to capture a scene. Learn about and photograph a species of plant or animal that makes its home in your region. Show a child -- one of our future leaders -- how to take a picture of flowers or trees in his or her own backyard. Read up on the life of a famous nature photographer, such as Ansel Adams, Philip Hyde, and Roger Tory Peterson. Ask yourself how any of your photos could be used to further the cause of conservation! Arrange a slide show for a community service group, senior citizens' center, bird watching group, or other organization. Select a subject you have never photographed before and make plans to photograph that subject on Nature Photography Day. Select a subject in nature that is either small or common -- one that is easily overlooked -- and photograph it in a way to make the ordinary seem extraordinary. Decide on a special location to photograph a sunrise or sunset. Plan to repeat that episode at the same time and location every Nature Photography Day. Give yourself a photography assignment to call attention to barriers between humans and nature: man-made obstructions that intrude on our ability to enjoy -- and photograph -- nature. Examples are telephone lines running through otherwise pristine natural scenes, clear cuts, and wetlands surrounded by buildings. 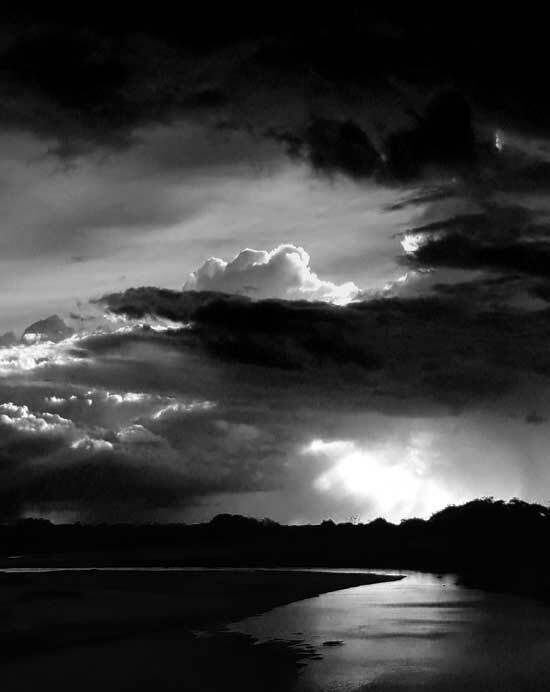 Photo Details: Late afternoon storm clouds loom dramatically over the Limpopo River, Tuli Block, Botswana. Additional Info: Photo converted to monochrome using Channel Mixer in Photoshop. There are many methods of converting color images to black and white in Photoshop, including "Convert to Greyscale" and "Desaturate". However, using Channel Mixer one can adjust individual red, green, and blue channels for more dramatic effects. It's the digital equivalent of using red, green, or blue filters on a camera loaded with black and white film. An added bonus of this method is that the image remains in RGB mode, so can be further manipulated and tweaked. 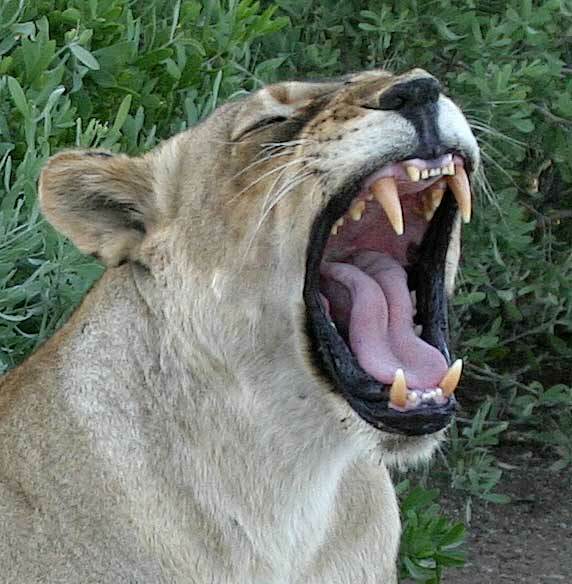 Photo Details: Close-up of lioness (Panthera leo) yawning, revealing her formidable canine teeth, Mashatu Game Reserve, Tuli Block, Botswana. Lions use their canines primarily for grabbing, holding, and killing their prey, while the back teeth are for ripping and chewing. Photo Details: Nyala bull (Tragelaphus angasii) walking next to waterhole, Mkhuze Game Reserve, KwaZulu-Natal, South Africa. 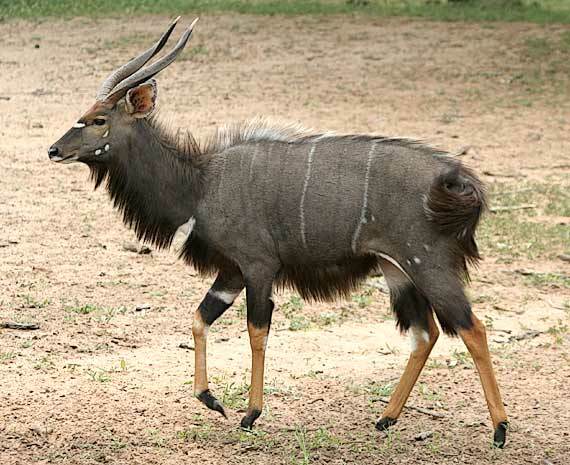 More Info: The attractive nyala antelope, with its lyre-shaped horns, slatey grey coat and distinctive white markings, occurs only in the north-eastern regions of southern Africa, so is less frequently sighted than some of its cousins like impala or kudu. Nyala males follow a complex repertoire of status displays to show their dominance - which no doubt some will say is typical of male behavior. When a potential rival encroaches on a male's territory, the first thing he does is make himself look bigger (left). 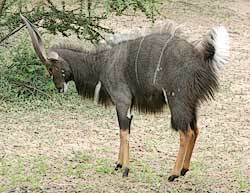 He stands broadside, raises the hair on his neck and back and curls his tail upwards, fanning out the white hairs on the underside, while lowering his head so his horns point forward. 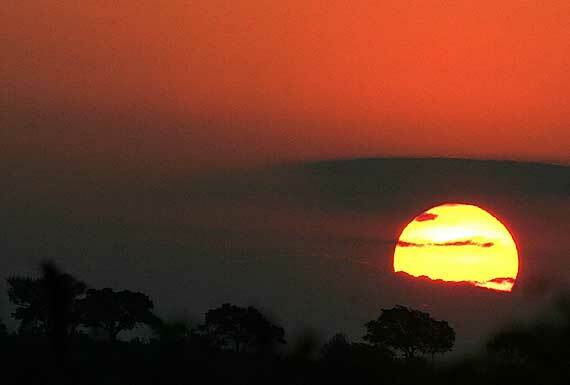 Photo Details: Sun setting in the Kruger National Park, South Africa. Additional Info: Towards the end of last year - on December 12 - I posted a photograph of an African sunrise. For some reason, I'm not sure why, I associated it in with the approach of the summer solstice in the southern hemisphere. Anyway, it's now six months down the track and we've just had our winter solstice, so staying with that theme, it seems appropriate to feature a typical African sunset. From now our days will gradually start getting longer and, eventually (thank God! ), warmer. When conditions are right (red sky, yellow/orange sun, possibly some cloud), it's not difficult taking sunset or sunrise photos, particularly if you have a powerful telephoto lens. Remember though it's not wise to look directly at the sun through a long lens, even early or late in the day. So rather position the sun off-center. This in turn can influence the camera's exposure meter, so try a number of different exposure settings. I prefer under-exposing to ensure the red sky is not washed out. If it's too dark, I know I can always brighten it up in my image editor. As mentioned, sunset-type shots are not difficult to take, yet they remain popular, probably because of the dramatic colors.